Eight known species of the southern United States. 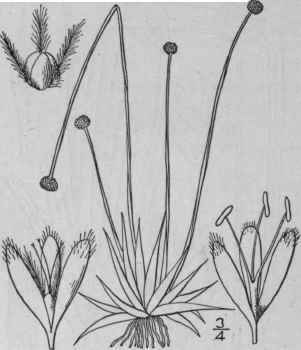 Type species: Eriocaulon anceps Walt. Eriocaulon anceps Walt. Fl. Car. 83. 1788. L. Michauxii Kunth, Enum. 3: 497. 1841. L. anceps Morong, Bull. Torr. Club 18: 360. 1891. Leaves glabrous or sparingly pubescent, 1'-3' long, tapering to an obtuse callous tip. Scapes slender, 2-20' tall, 2-4-angled, clothed with long soft appressed upwardly pointed hairs; sheaths equalling or shorter than the leaves; heads globose, 1-3" in diameter; involucral bracts ovate or oblong, shorter than the flowers, usually brown; flowers about 1" high; scales brown, spatulate, surrounded at the base by the yellowish silky hairs of the receptacle and white-bearded at the apex; perianth of the staminate flowers short-stalked, pubescent at the base, woolly and fimbriate at the summit; segments of the pistillate perianth white, glabrous, obtuse; ovary densely villous around the base; seeds strongly ribbed. In moist pine barrens, Virginia to Florida. The white pistillate flowers mingled with the brown staminate ones impart a mixed gray and dark appearance to the heads. March-June.